Join two tables in Excel. 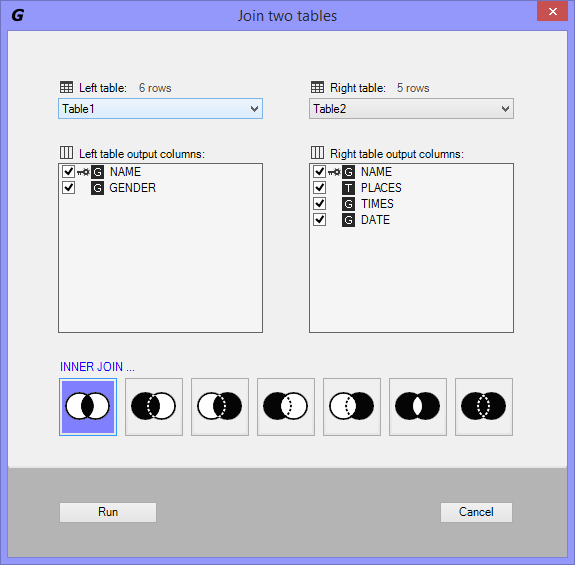 Create the tables you want to join and then click the "Join tables" button to get the following window opened. Select the left table you want to join with. Select the output columns from the left table that will show in the result data. Note that the key column can not be deselected. By default the first column is set as key column and all columns are set to General data format. Right click to set a column as key or to format the output column to Text, Number or Date. Select the right table you want to join with. Select the output columns from the right table that will show in the result data. Note that the key column can not be deselected. Click Run to execute the join tables process and write data results into a new worksheet. Click Cancel to close the Join Tables window. Selects all rows from both tables as long as there is a match between the columns in both tables. Selects all rows from the left table, with the matching rows in the right table. The result is NULL in the right side when there is no match. Selects all rows from the right table, with the matching rows in the left table. The result is NULL in the left side when there is no match. Selects all rows from the left table, with the matching rows in the right table. The result is NULL in the right side when there is no match. MINUSS, Rows from both tables as long as there is a match between the columns in both tables. Selects all rows from the right table, with the matching rows in the left table. The result is NULL in the left side when there is no match. MINUSS, Rows from both tables as long as there is a match between the columns in both tables. Selects row from either table when the conditions are met and returns NULL value when there is no match. MINUS, Rows from both tables as long as there is a match between the columns in both tables. Selects row from either table when the conditions are met and return NULL value when there is no match. This window can be opened by clicking the triangle button at the bottom right side of the Database group in GEGPRIFTI ribbon. #N/A (Value Not Available, Default) This is the default configuration. Each time that there is no match between tables the unmatched values will display the #N/A Excel error. Blank Each time that there is no match between tables the unmatched values will display blank. Blank cells can be determined by using the =ISBLANK function in Excel. Custom null value Specify a custom NULL value each time that there is no match between tables. Case sensitive (Anna ≠ ANNA) Specify if matching key columns should be case sensitive. 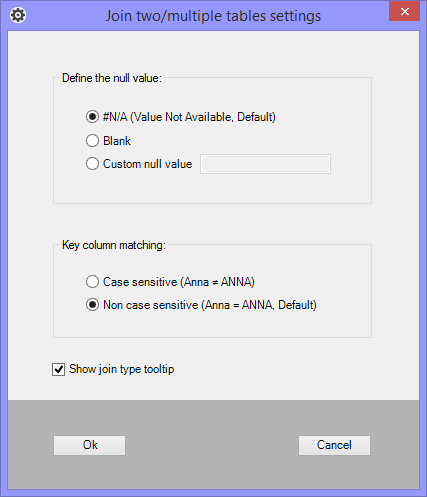 Non case sensitive (Anna = ANNA) Specify if matching key columns should be non case sensitive. This is the default. If checked the tooltip will popup each time you hand over the mouse at a join type button.